I’ve been a negligent netizen again, barely keeping up with any of my online activities. I think I’m going to have to start doing Illustration Friday again, just to keep me updating, in addition to getting back in the groove in other online arenas. So what have I been doing? Well, it’s been a bit of a hectic time out in the real world, which has sapped a lot of my attention. But I’ve also been drawing! I’ve been making some real headway on a personal project. Want a sneak preview? Yup, that’s the Ox from my last installment up in the corner, next to another nearly-finished drawing. The bottom row has concept sketches, another nearly-finished image, and one that’s been traced onto the bristol and ready to ink. 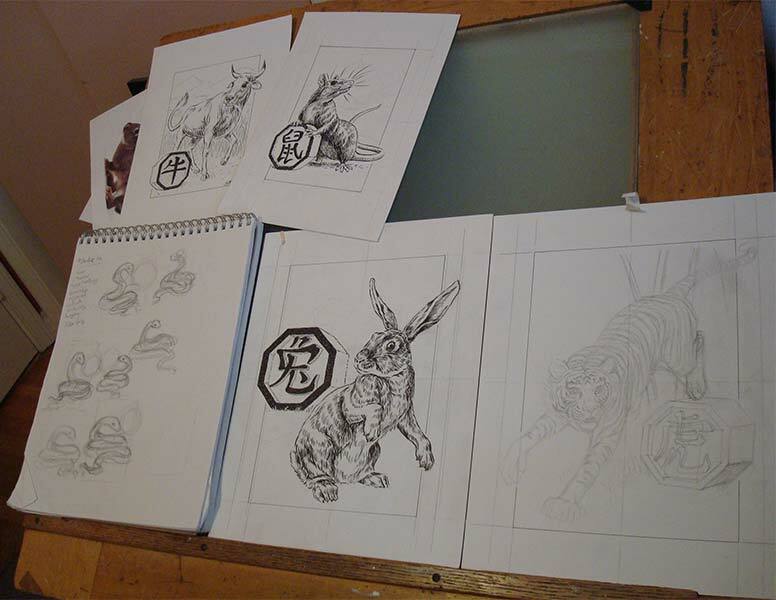 Some of you will probably recognize the Chinese Zodiac taking shape here. As with most of my personal projects, I have to fight the urge to over-think things. As it is, you can see that I started this series before I got my A3 scanner, at which point I realized I could switch to a larger size paper  which I’m loving! I’m still debating a bit what to do with the backgrounds: make a full scene like I did with the Ox, or keep it abstract… full color or more monochrome. One of the beauties of working digitally is being able to play with options, so I’ll probably end up with more than one version of each. I’m actually further along than this picture indicates  the Tiger is inked now and looks fantastic, if I do say so myself. The scales on the Snake, however, are killing me! More updates when I start scanning these babies. When this series is done I’ll be making several nice products available to buy, so if you’re interested… stay tuned! I’m still taking suggestions, so if there were any images from this blog that you absolutely had to have a nice printed copy of, let me know and I’ll make it available. Another update soon, I promise! This entry was posted in behind-the-scenes, Scribbles by stephanie. Bookmark the permalink.